Note: Global Justice Ecology Project broke the story about the California-Chiapas-Acre REDD Deal and the impacts it would have on the Indigenous populations of the Lacandon jungle in Chiapas, Mexico following a trip taken by then-GJEP Media Coordinator Jeff Conant (quoted below) and GJEP Board Chair and co-founder Orin Langelle to the Indigenous village Amador Hernandez, deep in the heart of the Lacandon jungle in March of 2011. GJEP, along with Friends of the Earth, Indigenous Environmental Network and others have continued to monitor the situation in Chiapas, as well as to actively oppose the inclusion of REDD in the California cap-and-trade program, and to fight against REDD at the UN climate conferences. While it is surely great news that Chiapas has decided to suspend the disastrous REDD program, we know that the fight is far from over. 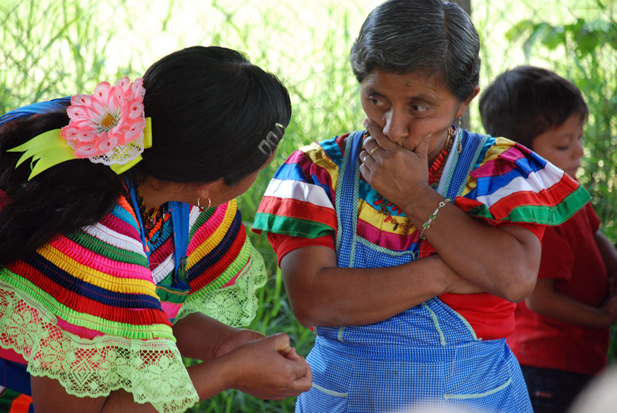 To view the photo essay from GJEP’s 2011 trip to Chiapas, click here. To view the 28 minute film we produced on the topic, click here. July 18, 2013. Source: Friends of the Earth-U.S. The state government of Chiapas has cancelled a controversial forest protection plan that critics said failed to address the root causes of deforestation and could endanger the lives and livelihoods of indigenous peoples. The program is linked to California’s cap-and-trade program through a complex “carbon offset” scheme that has yet to see the light of day. What the suspension of the program means for California’s agreement with Chiapas remains to be seen. The program, instituted in 2011 after Chiapas signed an agreement with California as part of California’s Global Warming Solutions Act, AB32, has been widely criticized by civil society groups for its lack of clear objectives, absence of baseline measures of deforestation, and failure to engage indigenous people’s organizations or take into account historic tension over land rights that plague the region. This week’s Earth Minute discusses the impacts of the climate crisis on the Indigenous Tarahumara people of Mexico who are suffering from a food crisis brought on by both a record drought and a disastrous freeze. To listen to this week’s earth minute click the link below and scroll to minute 57:48. The Indigenous Tarahumara People, in the Mexican state of Chihuahua, are some of the latest victims of the climate crisis. Their crops have been destroyed by a combination of the worst drought in 70 years compounded by a record-breaking freeze. The Tarahumara, known for extreme long-distance running in their mountainous homeland, have been an inspiring symbol of strength and self-reliance in Mexico. The idea that these fierce people are now starving has mobilized a rapid relief effort in Mexico. While some may think that the impacts of climate change are a problem of the future, more and more people are experiencing the impacts of extreme weather today–droughts, floods, out-of-season tornadoes, record warm spells and freezes, wildfires and severe storms. And these impacts are only projected to get worse. It is time we get serious about challenging the dependence on fossil fuels, industrial agriculture and over-consumption that are driving the climate crisis. Systemic transformation is essential. We cannot wait until it is too late. Note: This article arose out of the heated debates on REDD (the Reducing Emissions from Deforestation and Forest Degradation scheme) at the UN Climate Conference in Cancun, Mexico in 2010. GJEP actively campaigned against REDD there and supported the important work of our Indigenous allies who were there to oppose REDD. As a result, GJEP is quoted opposing REDD in the article below. “That’s the one,” said Arcenio Osorio, pointing at the huge mountain that towers over the village of Santiago Lachiguiri, in Oaxaca state, part of southwestern Mexico’s Isthmus of Tehuantepec. “It provides water to all the towns in the area, and to us, the Zapotec people, it’s sacred. That’s the mountain we wanted official protection for.” Osorio is secretary of the community assembly, a traditional elected body that represents the people of the village. The 8,000 inhabitants of the county have always been involved in the conservation of their mountain, the Cerro de las Flores (“Mountain of the Flowers”). An official from the National Commission for Protected Natural Areas (Conanp) told me it is classed as an area of “exceptionally high biodiversity” due to the “excellent state of preservation of its ecosystem”. In the valleys at the foot of the mountain, they grow organic coffee. The slopes are covered with little woods and patches of maize, but after several hours of walking and clambering you come to forests of pine trees, under which grow hundreds of species of wild flowers. Because of its altitude (2,200 metres) and the rock it is made of, the mountain acts as a kind of sponge, which stores the greater part of the area’s water supply. As a result, the conservation area ended up including the flanks of the mountain, where 140 smallholders had been growing maize. A further 517 hectares were included in the “payment for environmental services” programme, under which agricultural activities are forbidden, but the community receives an annual payment of 400 pesos (US$30) per hectare, that is $15,510 a year. It’s not much — and less than they were making from farming the land. The conservation plan also described a range of activities that would supposedly enhance the area’s resources without damaging the environment. The two flagship projects were an ecotourism initiative and a water-bottling plant. Both were abandoned after four years. Two cabins intended to accommodate tourists were never used — this remote area attracts few visitors — and the cost of transporting the bottled water proved prohibitive. But it was farming that stirred up the most trouble. The local community practised slash-and-burn cultivation (land is cleared, burned and then planted every seven years). The ash serves as a natural fertiliser and the wood is used as cooking fuel. Typical crops are maize, beans, tomatoes and peppers. Anthropologist Eckart Boege says that, when properly managed, according to strict rules, itinerant cultivation is the best way of farming without destroying the environment; the Mayas were masters of this technique, in both production and reforestation. But Mexican and international institutions have identified this farming method as the latest big threat and they all want a ban on burning, since carbon capture has become the central element of conservation policies. Slash-and-burn has in fact caused environmental damage in Mexico, leading to deforestation, soil impoverishment, water shortages and reduced biodiversity. But this is not the case with land occupied by indigenous peoples such as the inhabitants of Santiago Lachiguiri, who have established strict community rules (1). “If it’s properly used, the technique can actually increase the biological diversity and mass of the forest. We release CO2 by burning, but we capture more during the regeneration phase,” explained Alvaro Salgado, agronomist and author of a study on slash-and-burn. These facts have been recognised in scientific publications but are denied by Conanp, which is busy imposing another project on the village — agro-forestry, a system that integrates trees into a system of permanent cultivation, in this case apricot trees and maize. The results have failed to convince the locals. In three years, the soil has become impoverished and the trees are scrawny. “Since the maize yields were poor, Conanp advised us very early on to use chemicals to enrich the soil,” said Eduardo. Another result was that most of the 140 smallholders who had lost their land left the village. Some emigrated to the US, some moved to the city, some went to work on a motorway construction site, and the youngest joined the army after a recruitment campaign. The villagers demanded the removal of the mountain’s protected area status and an end to the payments for environmental services. They also sent two representatives to the Alternative Global Forum that was held at Cancún in December 2010 in parallel with the 16th Conference of the Parties to the United Nations Framework Convention on Climate Change (COP 16). Their aim was to denounce the conservation policies that were being imposed. Their testimony was of the highest importance: it was COP 16 that approved the agreement on forest conservation proposed at COP 13, in Bali in 2007 — the REDD (Reducing Emissions From Deforestation and Degradation) programme. Unable to agree on reductions in greenhouse gas emissions, the signatories hoped that REDD would kill two birds with one stone, cutting emissions by 15% while preventing deforestation. Diego Rodriguez from the World Bank had no doubts REDD would enable the world to prepare for climate change. Yet REDD shows little concern for the 300 million people across the world who depend on forests for their living. The programme is based on “compensation”: any business enterprise or country that pollutes can compensate for its greenhouse gas emissions (quantified in terms of tons of carbon) by “protecting” a forest. Advocates of REDD claim this approach is scientific but it does not appear to have convinced everyone. Research by Stanford University in California shows that the Intergovernmental Panel on Climate Change overestimated the amount of carbon stocked in a forest in Peru by one-third (2). Anne Petermann of the NGO Global Justice Ecology Project says the idea that carbon can be stocked implies a ban on the felling of trees. Indigenous groups are opposed to REDD, she says, because they believe it will inevitably displace communities or have a serious impact on their way of life, without doing anything to reduce pollution or climate change. Representatives of indigenous peoples, who came to Cancún in large numbers, hoped to impose a requirement that free, prior and informed consent be obtained before the implementation of any REDD project. “We want to be able to say no if a company wants to use our territory to compensate for carbon emissions,” said Onel Masardule, representative of the Kuna people of Panama. But REDD’s final text merely refers to “social and environmental safeguards”, which have yet to be defined. It mentions the UN Declaration on the Rights of Indigenous Peoples (which says that “indigenous peoples have the right to determine and develop priorities and strategies for the development or use of their lands or territories and other resources”), but the declaration isn’t binding. Two recent reports (3) on respect for indigenous peoples in REDD programmes indicate that the land rights of local inhabitants and principles of consultation and information have been systematically flouted. Over the past six years, a range of projects have been financed by enterprises (Shell and Gazprom in Indonesia, BP in Bolivia, and Rio Tinto in Australia), by countries (Norway in Brazil and Indonesia, France in Mexico) and special funds belonging to international institutions such as the World Bank and UN agencies. The Cancún Agreements did not decide how the REDD programme was to be financed but the idea, still championed by the World Bank, of offering REDD carbon credits on the global emissions market already seems less viable. It is now accepted that the markets have done nothing to help reduce carbon emissions or to promote the financing of a less polluting economy. Kate Dooley, an expert on forests at the NGO Fern, says carbon trading does not encourage people to use less carbon but gives the illusion that it’s possible to compensate for pollution. She fears that if REDD were to become part of the carbon trading market, there could be a wave of land speculation based on assigning a “carbon value” to forests. But the so-called developed nations, which are historically responsible for climate change, have refused to finance REDD alone. A decision on the issue has therefore been put off until COP 17, to be held in Durban, South Africa, 28 November—9 December 2011. We’re proud to announce that the short documentary video Global Justice Ecology Project produced this past Spring, Amador Hernandez, Chiapas: Starved of Medical Services for REDD+, (watch film below) is being shown this week in London as part of Native Spirit Film Festival. The festival is a season of films, performances and workshops celebrating the cultures of Indigenous Peoples across the Earth, founded and counselled by Indigenous people, as a platform to promote the voices of Indigenous cultures and the protection of their rights. While our entry in the festival is a humble ten-minute documentary, the process of producing this short video, we think, was exemplary. When Orin Langelle and I traveled to Chiapas this past March to investigate the emerging impacts of REDD+, we met with a small film collective, Komen Ilel. Two members of Komen Ilel, Angél Galán and Fuyumi Labra, excited about our project, volunteered to accompany us on a trek into the jungle. Because of the nature of our visit to the remote community of Amador Hernández, even as we began our two-day trek, there was no certainty that Angél and Fuyumi would be allowed to film. Indeed, due to a long history of outsiders taking disrespectful advantage of the villagers, there was no certainty that our colleagues, or their cameras, would be allowed to even set foot in the village. After a ten-hour drive from San Cristóbal de las Casas to the military-occupied village of San Quintín, where the road ends at the border of the Montes Azules Biosphere Reserve, our small crew was met by representatives from Amador Hernández. They took us to a nearby village to spend the night before traveling further into the jungle. There, we spoke, formally at first, and then with more ease. Our goal, we said, was to interview the villagers about any concerns they might have about REDD+ as it was manifesting there in the Lacandon jungle. The young man speaking for the village said that their concern, above all, was to let the world know of a particular injustice they were suffering: a year previous to our visit, the government had cancelled all medical service to the village. Several children and elders had died as a direct consequence. After some length of discussion, it became clear that the two concerns were one: the negation of medical services appeared to be part of the government’s strategy to pressure Amador Hernández to negotiate for relocation, in large part due to the need to demarcate the borders of the Montes Azules Reserve for a forest-carbon inventory. With this revelation, we asked the village representative: could we bring our film crew and capture some interviews on film. Our documentary work, we said, might help the village to demand restoration of its right to health, and to its territory. He agreed that this was a good idea, but whether we would be permitted to film was a question for the village assembly. The next morning we hiked fifteen kilometers, through the Lacandon’s black, boot-sucking mud, and arrived at the village by afternoon. After darkness fell, an assembly was called, and we – Orin, Angel, Fuyumi, and myself – were invited to attend, and to speak. To the forty or fifty Tseltal Mayan campesinos gathered in the dusty half-light of a bare solar-powered bulb we presented ourselves and declared our intentions. Our words, translated into Tseltal, were batted around the assembly, fed into the age-old process of lajan laja, or consensus-building. Finally, the assembly decided that, yes, we could conduct our interviews, and yes, we could film anything we wanted. The only condition on their part was that, aside from whatever other material we would produce, we make sure that their primary concern – the withdrawal of medical services – be addressed, so the world would know. It is to Angel and Fuyumi’s credit that the short video they produced for GJEP does precisely what the Amador Hernández community assembly requested – it tells the story of the withdrawal of health services, while making it clear that this concern is directly linked to government efforts to remove the village due to the demands of impending carbon deals. We are extremely pleased and proud to have had this short video chosen as a selection in this year’s Native Spirit Film Festival. Do Trees Grow on Money? Note: Global Justice Ecology Project Comunications Director Jeff Conant and Co-Director/ Strategist Orin Langelle traveled to the community of Amador Hernandez in the Lacandon Jungle of Chiapas, Mexico in March of this year. While there, residents were interviewed about their opinions regarding use of forests as carbon offsets, and about the threats of relocation the community was facing due to plans to “protect” the forest and sell its carbon to California companies as offsets. A statement was recently released by the communities of the region of Amador Hernandez condemning REDD+ (the scheme to Reduce Emissions from Deforestation and Forest Degradation). You can read that statement here. In Mayan cosmology, the ceiba tree, with its elephantine, silver-grey trunk that towers above the jungle, is the tree of life, shoring up the corners of the sky and sending its roots deep into the underworld. In the centuries following the conquest of the New World, Mayans by the thousands were forced to work in monterias , or timber camps, and the ancestral role of the ceiba as a bridge between the world above and the world below gave way to the board-feet of timber the trees surrendered when felled. The ensuing rush for sugar, for rubber, for minerals, and for cattle left the jungles of Mesoamerica reduced to a fraction of their original area and devastated the peoples who once thrived there. Today, another vision is shaping the jungles of southern Mexico: The idea that protecting forests is central to the struggle against global warming. Under REDD, “forests” may also mean plantations. Tropical deforestation and forest degradation contribute between 12 and 20 percent of global greenhouse gas emissions, as some 13 million hectares of forest are lost annually. The Lacandon Jungle on the border of Chiapas and Guatemala is a case in point: Only about 10 percent of the jungle remains intact. Saving forested areas like the Lacandon is key to reducing the impacts of runaway climate change. Past efforts to reduce deforestation, like setting up protected areas or promoting sustainable land-use practices, have had limited success. That’s because the drivers of deforestation – agriculture, mining, fossil fuel extraction, paper demand – offer rich financial rewards. But what if forests were more valuable left standing than cut down? A new policy mechanism is being developed to do just that. Dubbed REDD, for Reducing Emissions from Deforestation and Degradation, the mechanism (along with a list of spin-offs such as REDD+ and REDD++) is backed by major multilateral institutions such as the United Nations and the World Bank. Support for REDD spans the spectrum of green groups, from market-minded conservation NGOs likeEnvironmental Defense and Conservation International to more capital-skeptic outfits like Greenpeace. “Saving our forests is good not only for the atmosphere,” she said. “It’s also good for Indigenous Peoples.” Chiapas Governor Juan Sabines, on hand to promote his state’s comprehensive Climate Change Action Program, nodded in vigorous agreement. But as official delegates applauded REDD in Cancún’s plenary halls, grassroots activists in the streets were staging protests against the policy. Benign as it may appear, what outsiders see as forest protection many locals see as the potential loss of their homes. REDD is fiercely contested by many human rights advocates and Indigenous Peoples’ organizations, who see in it the continuation of colonial resource extraction at best, and at worst perhaps the largest land grab in history. The REDD scheme unfolding in Chiapas offers a particularly compelling test for this controversial idea. 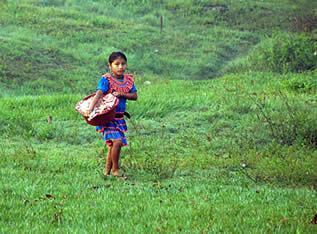 Home to most of Mexico’s tropical trees, a third of its mammal species, and half of its bird and butterfly species, the Lacandon is also, famously, home to the Zapatista Army of National Liberation, the insurgent rebel group that rose up in 1994 to demand that Indigenous Peoples be allowed to control their own territories. That struggle, and the Mexican government’s response, has engendered paramilitary massacres, years of counterinsurgency, and tens of thousands of displaced people – and it can be traced, in part, to a decades-old agreement that took as its pretext the protection of the Lacandon. The region’s rich biodiversity, open conflicts over land tenure, and the potential investment from California make Lacandon a fascinating test case – or an instructive cautionary tale – of what REDD may bring. REDD works like this: Because trees capture and store CO2, maintaining intact forests is essential to mitigating climate change. REDD proposes that governments, companies, or forest owners in the global South be given financial incentives for keeping their forests standing. REDD was formally taken up by the UN-sponsored climate change talks in Bali in 2007. Since then it has moved rapidly to the forefront of the climate agenda. Norway, its biggest donor, has pledged upwards of $120 million to the UN REDD program, and given $1 billion each to Indonesia and a confederation of Amazonian states to establish the program. In December 2010, REDD was adopted into the UN’s Cancún Agreements, the closest thing to an extension of the Kyoto Protocol. While paying to preserve forests appears to be a long-overdue gesture of goodwill, it brings up an array of thorny questions. For starters, what is meant by “forests”? Because the UN’s definition is unclear, “forests” under REDD may include monoculture tree plantations or even genetically engineered trees. Since timber, paper, and biofuel plantations are more lucrative than natural forests, REDD could fund the destruction of native forests and their replacement with tree plantations. One reason why REDD appears compelling is that, given the rapacious demand for resources, it is difficult to imagine a counterforce strong enough to halt forest destruction. Another is the deadlock in the UN negotiations. Nations’ resistance to binding emissions reductions makes REDD one of the only games around. But even such a bastion of market fundamentalism asThe Economist magazine suggests that “REDD may not be possible at all,” due to factors including corruption and the fact that most of those who live in and care for forests do not have legal title to their lands. Pavan Sukhdev, former head of the UN Environment Programme’s Green Economy Initiative, estimates the value of global ecosystem goods at $4.5 trillion per year. “The rewards are very clear,” Sukhdev says. The problem is how to generate these rewards, literally out of thin air. The offsets-based REDD scheme that is in the pipeline requires a stable and reliable carbon market. And so far there isn’t one. Beyond the ecological concerns, REDD is proving exceedingly elusive to put into practice. One fundamental question is: Where will the money come from? At present, there is no “compliance market” for REDD – meaning it is not yet part of any mandated legislative effort to reduce emissions. Of numerous government-sponsored REDD projects worldwide, the agreement between California and Chiapas, expected to come on line by 2015, is the most advanced. The most likely source of funding for REDD is a combination of private investment and multilateral funds, boosted by a huge dose of carbon offsets from industry in wealthy nations. An offset-based REDD will allow those who protect forests to earn carbon credits – financial rewards based on the amount of CO2 a forest can store and a market-derived price per ton of CO2. Governments (or NGOs, or local communities) that protect forests can then trade these credits to industrial polluters for revenue that, in theory, provides incentive not to cut down trees. But if the money comes from carbon offsets, as the UN and the California protocol propose, this means that even if deforestation is reduced, industrial emissions – the main driver of climate change – will not be. The offsets component brings REDD strong support from the fossil fuel industry. BP (yes, that BP) recently became the first company to join the World Bank’s Forest Carbon Partnership Facility, which will allow the company to offset its emissions. REDD’s market-share potential has also attracted the financial services industry – Merrill Lynch, Goldman Sachs, and Morgan Stanley – the same Wall Street speculators that threw the global banking systems into a tailspin. That is, the people who have the cash to put up the protection money. The villagers clearly perceived this as the legacy of a land tenure arrangement that has been at the heart of conflicts in the Lacandon for decades. In 1971, the Mexican government ceded over a 1.5 million acres to the Lacandon tribe – one of the six Indigenous groups in Chiapas – which at the time consisted of only 66 families. Seven years later, the government created the 800,000-acre Montes Azules Biosphere Reserve, overlapping the Lacandon territory. In order to give the first chunk of territory to the Lacandones, and to protect the second as a reserve, 2,000 Tzeltal and Ch’ol families – 26 villages – were moved. Among the displaced were some families who later came to form Amador Hernández. The resulting tension between the Lacandones and the rest of the region’s Indigenous groups led to the formation of several peasant farmer organizations demanding redress; some of these groups later coalesced into the Zapatista Army of National Liberation. The militant response made it impossible for the Mexican government to draw solid boundaries around the land in question. Now, with the promise of financing under REDD, the government is making a renewed attempt to get the boundaries drawn, to expel anyone without land title, and to inventory the Montes Azules Reserve to quantify, and then bring to market, the area’s carbon storage potential. But what Governor Sabines describes as voluntary resettlement takes on a darker shade from the viewpoint of those with no land rights. At the village assembly in Amador Hernández, villagers stood up one by one to denounce what they perceived as a land grab. A year before, the villagers said, all government medical services, including vaccinations, had been cut off; several elderly people and children died due to lack of medical attention. This neglect, they believed, was due to their refusal to capitulate to the demands of REDD. “They’re attacking our health as a way of getting access to our land,” Martinez said. The case of Amador Hernández appears extreme, but it’s hardly unique. As preparations for REDD are laid around the world, Indigenous communities in other countries – Ecuador, Peru, Congo – are saying, with increasing urgency, that forest protection without land rights represents a direct threat to their ways of life. The Price of an Arm and a Leg? A cornerstone of the UN Declaration of the Rights of Indigenous Peoples is a provision called Free, Prior, and Informed Consent. FPIC, as it is known, offers a theoretical bulwark against human rights abuses by declaring that Indigenous Peoples must have a say in projects that affect them. It is central to debates over REDD. Some argue that REDD can work as long as it includes FPIC safeguards. But FPIC is nonbinding, and as the case of Amador Hernández shows, it rarely works. What outsiders see as forest protection many locals see as loss of their homes. To be clear: Groups that oppose REDD are not against receiving funds from wealthy nations to maintain forests. The social movements that oppose REDD generally favor the creation of a fund to pay for the resources that industrialized nations have consumed. This is the idea of “climate debt.” Led by Bolivia, a coalition of more than 50 governments has submitted a proposal to the UN demanding that the costs of adapting to the climate crisis be borne by the countries that created the crisis, as a kind of reparations. It’s not that they don’t want payment; it’s that they don’t want payment based on pollution permits and market speculation. Solon’s analogy points to the core tension in the REDD scheme: We should protect forests because, like our own limbs, they have intrinsic value. To think that global policy will ever be guided by the principle of forests’ inherent worth and Indigenous Peoples’ rights is perhaps naïve. But no less naïve, and certainly no less dangerous, is faith that the market, and the industrial society that drives it, can solve the global catastrophe it precipitated. As global climate negotiations continue to generate friction without momentum, the world’s forests continue to burn in great blazes and to fall before an onslaught of mining, agribusiness, and timber plantations. REDD’s proponents envision a way to buy our way out of the cycle of destruction. And those who have inhabited and protected the world’s forests for millennia – and whose cultures have been devastated by the race to exploit resources – continue to press for a better deal. Jeff Conant is author of A Community Guide to Environmental Health and is Communications Director at Global Justice Ecology Project. Comments Off on Do Trees Grow on Money? Note: GJEP received this communique from COMPITCH (Consejo de Médicos y Parteras Indígenas Tradicionales de Chiapas –Council of Traditional Indigenous Doctors and Midwives from Chiapas). The communique was translated into English by Trisha Novak. In March of 2011, GJEP’s Jeff Conant and Orin Langelle went to Amador Hernandez in Chiapas, Mexico to investigate the threatened forced relocation of the community and it’s relation to REDD+ and the California-Chiapas, Mexico-Acre, Brazil climate deal. To the people of Mexico, to the people of the world, to the organizations and groups that do not serve the power interests but those of their own people, the lower classes. We reject and will not tire of confirming our rejection of the passing through the Lacandona Brecha next to our lands because it has as its purpose to make available the lands in the [Biosphere Reserve] to the service of the capitalist powers. The REDD+ project in the Montes Azules Reserve is the new mask, a climate mask, with which the federal government of Felipe Calderon and the Chiapas government of Juan Sabines attempt to cover up the dispossession of the biodiversity of the peoples. Speaking of climate change, it is clear to us that those who are most responsible are the capitalist enterprises and their governments, just like the federal government of Felipe Calderon and the Chiapas government of Juan Sabines, who have made a pact with the wealthy countries to allow that their greenhouse gas emissions be mitigated by the forests of our people. We reject all the ways in which the federal and the Chiapas governments and directors of organizations in service to the capitalists, want to dispossess us of our lands and our resources, through programs such as: REDD+ (in the Montes Azules Reserve), Reconversion Productiva (Productive Restructuring), Pago de Servicios Ambientales (Payment for Environmental Services) and FANAR (Fund for Agricultural Entities without Regularization). We point out the dual purpose of these programs: to dispossess us, but also to change our culture in order to disorganize us and neutralize our resistance. We denounce the control that the federal government exercises over the people which, by decree (1972), it called the Lacandon, and which it has been using to legitimize all the plans for taking the lands and displacement of our peoples. We reject the projects for tourism by the capitalists or of the federal or Chiapas governments, such as the one that has divided the common lands of Emiliano Zapata in Laguna de Miramar. We reject monocultures, especially for biofuels and the new peonage that the peasant undergoes on his own land, just as the big landowners imposed in times of the Porfirio dictatorship. We reject the policy of land seizures promoted by the World Bank, conservationist organizations and their neo-liberal governments like that of Chiapas. Likewise, we reject the other face of “development:” mining projects approved for regions that are not important for conservation and transnational exploitation of diversity, as happens in the Municipality of Chicomuselo where the people are resisting. We demand agrarian regularization of the communities of Galilea, Benito Juarez Miramar and Chumcerro, located within the Montes Azules Biosphere Reserve. To reorganize ourselves and expand at every level our relationships with other peoples and with independent organizations that are not at the service of the powerful in order to build a network of resistance among the peoples. To develop internal plans in our communities to strengthen the production of our own foods. To strengthen ourselves in the word of God and the community memory of our grandparents. Al Pueblo de México, a los Pueblos del Mundo, a las Organizaciones y grupos que no sirven a los intereses del poder sino a los de su propia gente, la gente de abajo. 1. Rechazamos, y no nos cansaremos de ratificarlo, el paso de la brecha Lacandona al lado de nuestras tierras porque tiene como propósito disponer las tierras medidas del lado Lacandón en servicio de las potencias capitalistas. 2. El proyecto REDD+ en la Reserva de Montes Azules es la nueva máscara, máscara climática, con la que el gobierno Federal de Felipe Calderón y el de Chiapas de Juan Sabines pretenden encubrir el despojo de la biodiversidad de los pueblos. 3. Hablando del cambio del clima, para nosotros está claro que los responsables mayores son las empresas capitalistas y sus gobiernos, como el Federal de Felipe Calderón y el de Chiapas de Juan Sabines, que han pactado con los países ricos que sus emisiones de gases de efecto invernadero se mitiguen en los bosques de nuestros pueblos. 4. Rechazamos todas las formas con las que los gobiernos, federal y de Chiapas, y dirigentes de organizaciones, en servicio de los capitalistas, quieren despojarnos de nuestras tierras y de nuestros recursos. Como los programas: REDD+ (en la Reserva de Montes Azules), Reconversión Productiva, Pago de Servicios Ambientales y FANAR. Llamamos a estar pendientes de la doble intención de esos programas: despojarnos pero también cambiar nuestra cultura para desorganizarnos y neutralizar nuestra resistencia. 5. Denunciamos el control que el gobierno federal ejerce sobre el pueblo que por decreto (1972) llamó Lacandón, que ha venido utilizando para legitimar todos los planes de despojo de tierras y desalojos de nuestros pueblos. 6. Rechazamos los proyectos turísticos de los capitalistas o de los gobiernos federal y de Chiapas, como el que ha dividido al ejido Emiliano Zapata en la Laguna de Miramar. 7. Rechazamos los monocultivos, en especial los de agrocombustibles y el nuevo peonaje al que es sometido el campesino en su propia tierra, como los hacendados hacían en tiempos de la dictadura porfirista. 8. Rechazamos la política de acaparamiento de tierras impulsada por el banco mundial, las organizaciones conservacionistas y sus gobiernos neoliberales como el de Chiapas. 9. Rechazamos igualmente la otra cara del despojo: los proyectos de Minería, aprobados para regiones no importantes para la conservación y explotación trasnacional de la biodiversidad, como sucede en el municipio de Chicomuselo donde resisten los pueblos. 10. Exijimos la regularización agraria de las comunidades Galilea, Benito Juárez Miramar y Chumcerro, ubicadas dentro de la Reserva de Biosfera Montes Azules. Reorganizarnos y ampliar a todos los niveles nuestras relaciones con otros pueblos y con organizaciones independientes que no sirvan al poder, para constituir una red de resistencia de los pueblos. Elaborar planes internos en nuestras comunidades para fortalecer la producción de nuestros propios alimentos. Fortalecernos en la palabra de Dios y en la memoria comunitaria de nuestros abuelos.